Posted on October 1, 2013 at 2:44 am. The children are adapting very well to their classroom!! All of us are truly enjoying being at school. Here are a few things we are working on in the classroom. 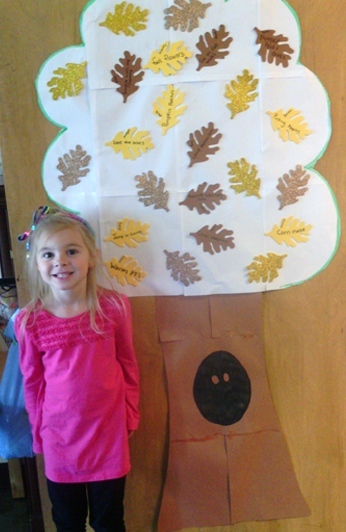 In language and vocabulary, we are learning about autumn’s changes, weather, nature, and activities. My students enjoyed observing the changing season this month and I loved talking with them about it! We are also discussed fire prevention and fire safety. While we were learning about fire prevention, children enjoyed trying new “routes” around the school, walking up the different stairways in the building to explore our safe exits. We also talked about “stop, drop and roll” and practiced putting action to those words! Students loved singing, “The Wheels on the Fire Truck.” Ask them about it I’m sure they will sing it for you! We also talked about Halloween safety, and the concepts of real and pretend. We also enjoyed new colors in our classroom for the Month of October which gave special attention to black and orange. I also enjoyed hearing the beautiful voices of our students as we sang together a few fun filled Halloween themed songs at circle time. We also focused on the directional and positional concepts of IN and OUT. We put objects in a variety of containers, and then took them out to demonstrate the concepts of IN and OUT. 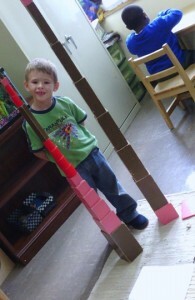 We also used a variety of the Sensorial materials to reinforce the concepts of big and little. Students were able to work on refining their fine motor skills this month while practicing with lacing, cutting, coloring, drawing, play dough manipulation making circles and path tracing. The children were also able to enhance their perception skills by learning about same and different, puzzles, sorting, and copying block and peg patterns. Gross motor activities such as organized games like musical chairs, tossing and catching and moving to the music is also enjoyed many afternoons! Students focused on where they live, learning their phone numbers, new ASL signs and also baked some very tasty items this month with Ms. Kristen in the afternoons. Students learned and sang their own phone numbers and worked hard to memorize their address, city, county and state they live in. Together they also enjoyed the tastes of the season by making a very tasty pumpkin dip, baked pumpkin seeds and even home made butter! Students also enjoy their yoga time with Ms. Kristen. The music and the moves truly help our students relax after a hard day at work! Last month I shared a bit about Practical Life in our classroom, this month I wish to focus on the Sensorial area. 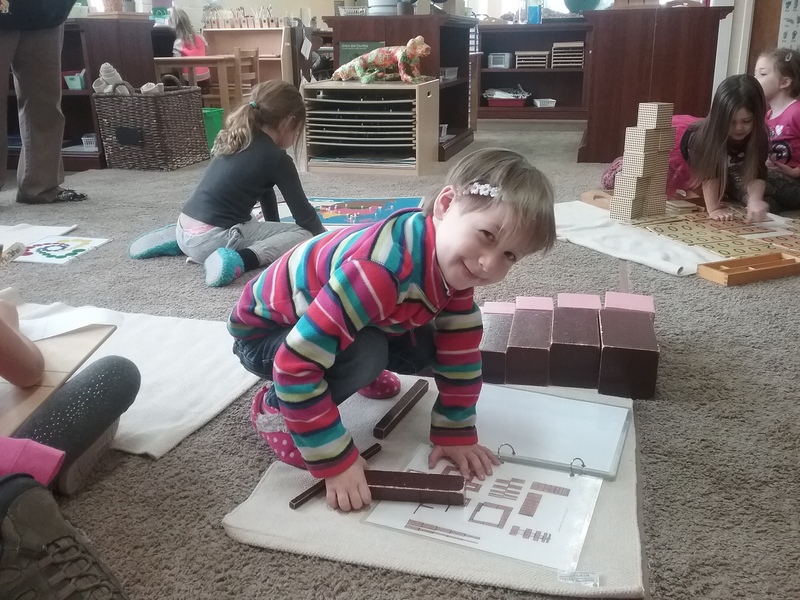 Every area of the Montessori classroom includes multi-sensory materials that encompass sight, smell, sound, touch, and taste. These sensorial areas of the Montessori classroom focus on educating through the senses. 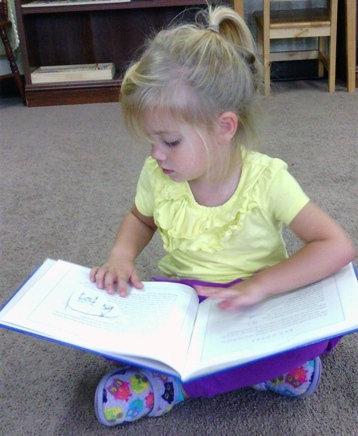 Dr. Montessori wrote, “Nothing comes to the intellect that is not first in the senses.” (Montessori Method). 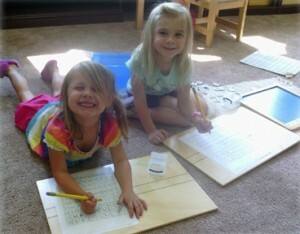 As early as the infant program, young children explore Montessori materials through their senses. 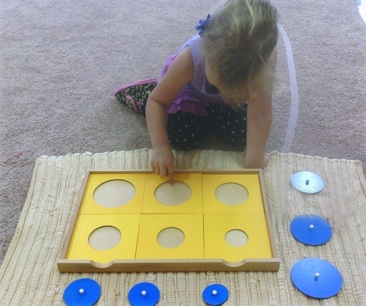 The toddler environment may include knobbed cylinders which are cylinders that have a knob, but are exactly the same size, making the child successful due to the self correcting nature of the material. 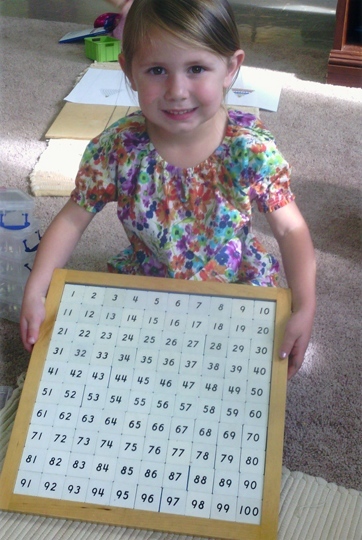 The 3-6 year old environment also includes knobbed cylinders but they are graded according to height, width or both to distinguish differences in these two properties. Attention is also drawn to the totality of an objects’ properties – size, shape, color, texture, weight, smell, sound… Eventually children learn to pay attention to small details in an object and the environment, which helps them discover how to learn. An additional sub-category includes geometry. 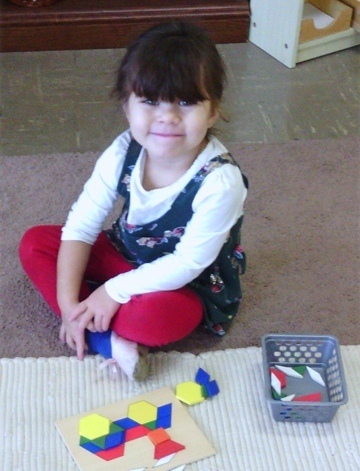 Geometry is introduced at the toddler level with shapes (circle, square, triangle, sphere, cube, prism) and further developed in the 3-6 environment and the elementary classrooms. The children are introduced to what they know first, plane figures. We begin with the triangle, square and circle. Once a child masters these basic plane figures, additional ones are introduced. 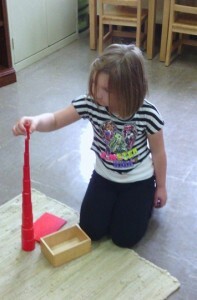 Then a child can find different plane figures in the environment. Once solids are introduced, a child can match a solid figure with its base. The sensorial area of the environment is one that naturally draws children to it so each child can explore and further develop their potential through the senses. 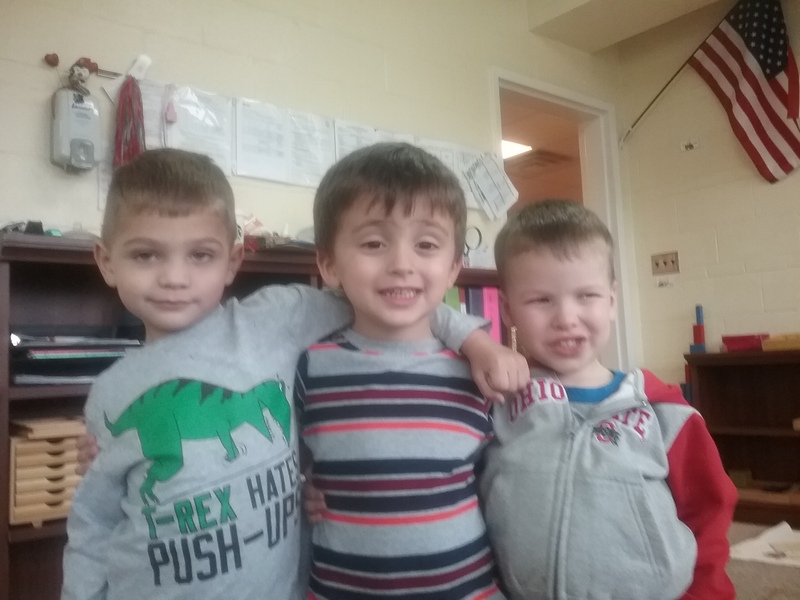 As I was reading the Ohio Department of Education standards for preschool learning and what is expected in grade K, I was amazed to find that the Sensorial area helps the child meet and exceed their ma thematic requirements, such as number, number sense and operations, measurement, geometry and spatial sense, patterns, functions and algebra, as well as, data analysis and probability! Keep your child moving to help them develop their senses. It is through movement that babies first learn to crawl, walk, and then run! Allow your child to walk (safely) on the flower bed wall. This encourages your child to develop a sense of balance and to become aware of them self. Let them jump, hop, skip… while playing games or outside. Take walks often – whether you live in an urban, suburban or other environment there are always things to see and do. Go on a sensory walk – listen for sounds or smells in your environment and point out smells and sounds that change with the different seasons. Your goal is to help heighten your child’s awareness and it is a wonderful opportunity to bond with your child. A walk can be around the block or a long hike. Let your child be the guide in terms of when they are finished or how long they want to continue. Keep sensory activities active. Video and computer games can be very sensory (especially visual and auditory) in nature, but limit the amount of time your child spends on this type of activity, even when there are good games as Overwatch that kids can play, and learn what to play in overwatch so they use their mind. Video and computer games tend to be very sedentary. Visit a new playground in your area. Find out where your community has handicap accessible playgrounds. Often, these playgrounds have equipment for blind or otherwise special needs children. These playgrounds provide a great opportunity for your child to learn about other children and their needs and the opportunity to play with something that might be new. Posted on October 1, 2013 at 2:40 am. “It is so quiet in here. It is so calm.” This is what I have been hearing teachers and parents say about my room. Usually it takes several months for my room to become normalized but this year it was on it’s way to being normalized within a month of school starting. I credit those around me for the earlier than usual success. Miss Kathleen and Miss Dana are wonderful teachers and work well with the students. They are fun yet firm and know how to handle difficult situations well. When I mentioned “those around me” I didn’t only mean the teachers but I want to give credit to the older students and the leaders of the room. They are showing the newer/younger students how to work with materials and are guiding them through the classroom. 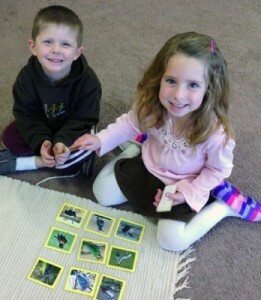 Children love animals, and I enjoy teaching them about different types of animals. This month we started by discussing mammals. I chose mammals because we are mammals. We learned that mammals have hair or fur, are born alive, and drink mother’s milk when first born. We learned that mammals are warm blooded (their body temperature remains constant) and that they are vertebrates (have spines). We learned that dolphins and whales are mammals and that the bat is the only mammal that can fly. Then we slithered our way into discussing reptiles. We came to the conclusion the snake is the most popular reptile. We learned reptiles are cold blooded, vertebrates, lay hard shelled eggs, and have dry scales. 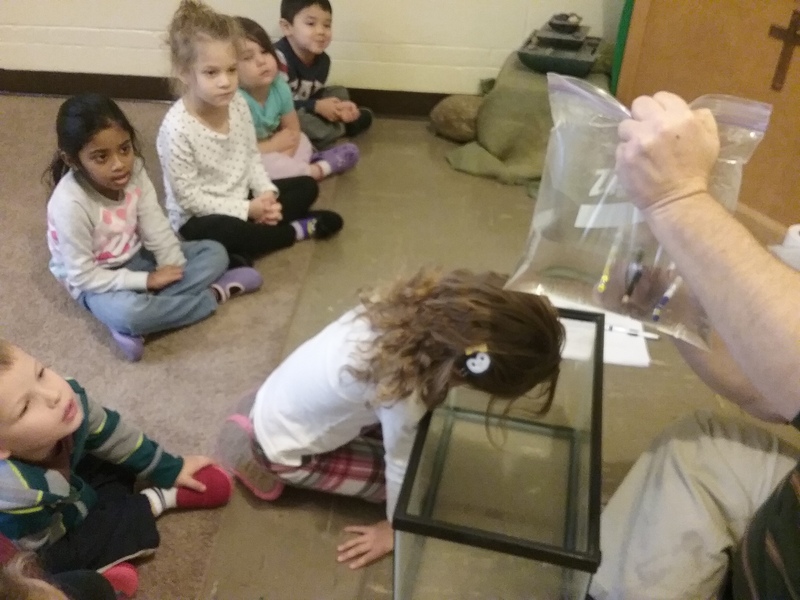 The children enjoyed seeing our own albino garter snake and a visiting black garter snake. The geckos were just as appreciated. Next, We hopped into our discussion of amphibians. We all agreed that the frog was the most popular amphibian and that amphibians are cold blooded and vertebrates. We also learned their skin is moist and soft and they can live on BOTH land and water. Amphibians lay eggs, these eggs have no shell but are like jelly. The children were encouraged to look for our Pac Man Frog and our Eastern Toads in our nature center. After learning about amphibians, we swam to our friends called fish. We learned that fish are cold blooded (their body temperature changes to the temperature in their environment) and are vertebrates. We learned that most fish have scales, gills and fins. Some fish lay eggs and some fish are liver bearers (babies are born alive). We introduced a new word, “habitat”. This is where something lives and the fish’s habitat is the water. The children were thrilled to learn that the shark is a fish.We then flew with the animals called birds. Birds have feathers, are warm blooded and are vertebrates. All birds lay hard shelled eggs and have wings. All birds have wings but some birds are flightless (cannot fly) such as the penguin, ostrich, and emu. 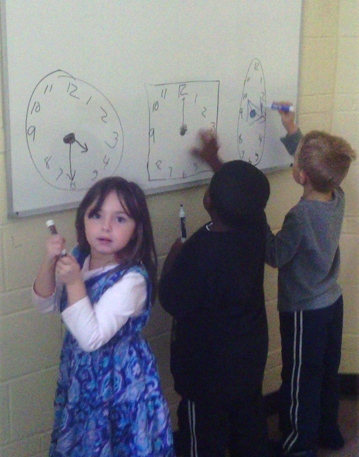 At circle time we count to ten in different languages. We now know how to count to 10 in English, Spanish, Sign Language, German, French, Greek, Japanese, Arabic with the Lebanese dialect, Italian, and Romanian. 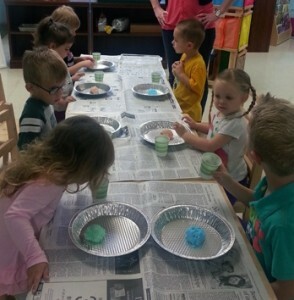 Kindergarten During Kindergarten Lesson, students learned about landforms. Ask them what the definition of a lake, island, bay, peninsula, gulf, harbor, cape, isthmus, straight, chain of lakes, and archipelago. We went over telling time to the hour, half past, and quarter after. Your kindergartners now know how to count to ten in, English, Spanish, Sign Language, German, French, Greek, Japanese, and Arabic with the Lebanese dialect, Italian, Russian, Romanian, Swedish, and Tagalog. Posted on October 1, 2013 at 2:32 am. During the month of October the class learned about all the changes that happen during the beautiful Fall season. For the first week we discussed leaves, how and why they change, and different types of leaves. 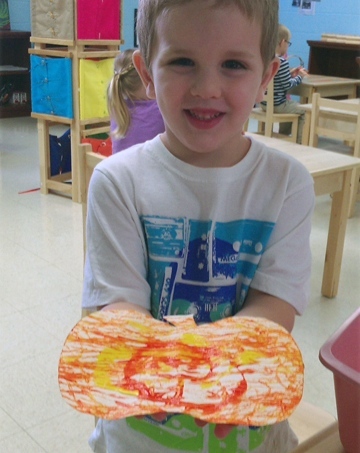 We also enjoyed leaf rubbings, leaf impressions, and sun catchers! 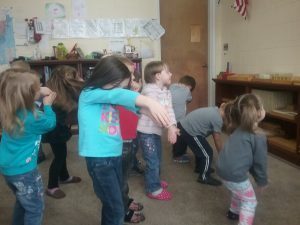 The class was also introduced to the letter “e” and turned the letter “e” into an elephant. 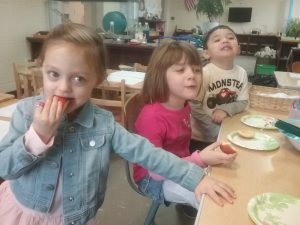 The second week of October your students learned about apples. 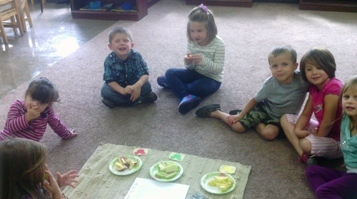 They got to taste test three different types of apples and vote on what was their favorite kind. We discovered what the inside of an apple looks like, how they grow, and how Johnny Appleseed was influential throughout Ohio and the surrounding states. Your students even brought home beautiful paintings using apples as stamps. The letter the students learned about this week was the letter f and decorated the letter with feathers. Next, the class learned all about pumpkins. We were able to explore the inside of what pumpkins look like by digging out the insides to separate the seeds from the pulp. The next day, the class was able to try the seeds they cleaned out of the pumpkin after they had been baked and even sampled some of the actual meat of the pumpkin cooked. The students also made a book of pumpkin faces they drew and even were able to play pumpkin bowling. 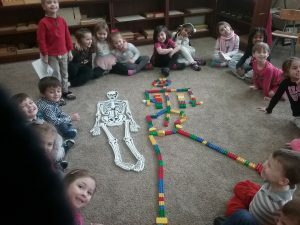 The letter “g” was introduced during the third week and students were able to turn the letter “g” into a giraffe and make a ghost. The final week of October we turned our attention to bats. We learned about different types of bats and even found out that there is a bat that is as small as a bumblebee! The class discovered how and where bats sleep and that they find their food through echolocation. The students then participated in an activity to use their listening skills in order to locate their friends around the room by listening to them clap while being blind folded. We even constructed our own bat to help decorate the classroom for Halloween. Your students were introduced to the letter “h”, which was perfect timing for the Halloween party. I wanted to thank all the parents who helped out with the Halloween party. It was definitely a success, and the kids enjoyed all of the crafts, games, and delicious food. We could not have had a more successful party! 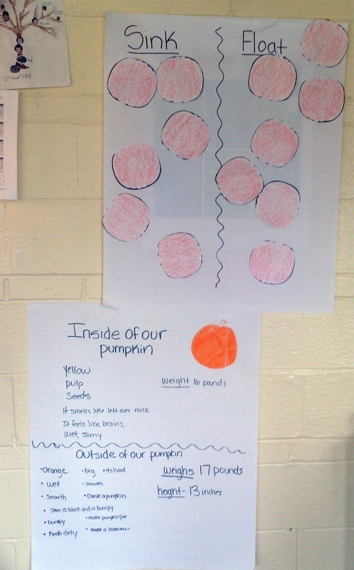 Over the past month, the students have been learning about the science behind the changes we see during fall. We found out that the leaves change color because they are not receiving enough chlorophyll to keep their color green. The students also learned the life cycle of apples, pumpkins, and bats. 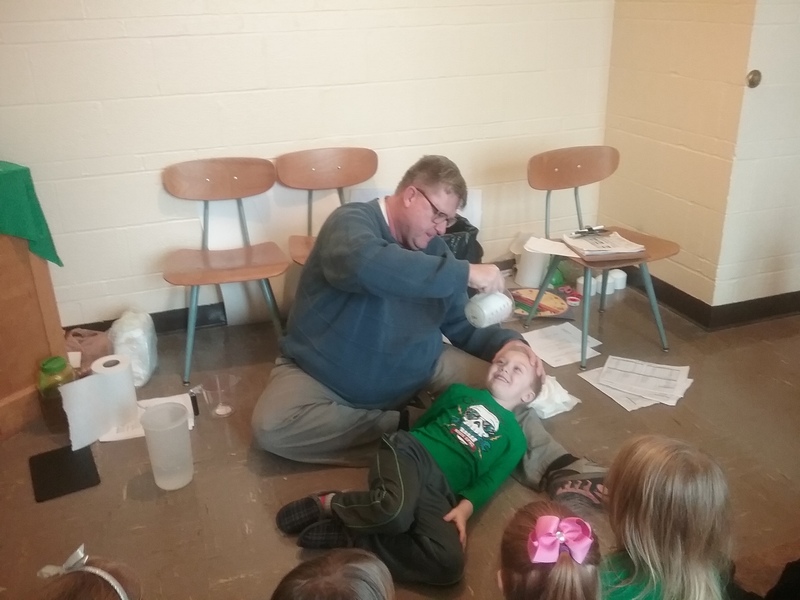 We also enjoyed a couple of fall themed science experiments such as an oozing jack-o-lantern when we mixed hydrogen peroxide with water and yeast. Then, I showed the students Dracula’s soap and had them observe the reaction caused by putting rubbing alcohol and crushed up Ex-Lax on my hand and then washed them with soap and water. The reaction between the chemicals in the medicine and the alkali in the soap made my hands turn red! That was very exciting! Posted on October 1, 2013 at 2:22 am. I can’t believe how fast the month of October went by. Our class was very busy this month learning about apples, being on the farm, all about leaves and chlorophyll, the life cycle of the pumpkin and the history of Halloween! We also had an amazing Halloween party! The first week I started off by showing the children a variety of apples such as the granny smith, golden delicious and the red delicious. The children were able to feel and smell the different apples. Then we grouped the apples by size and color. Throughout the week we talked about Johnny Appleseed. We discussed how he was a pioneer who traveled throughout the American frontier by planting apple seeds. We also discussed how he helped people along the way. The children really loved talking about him as they continued to ask questions about him all week! 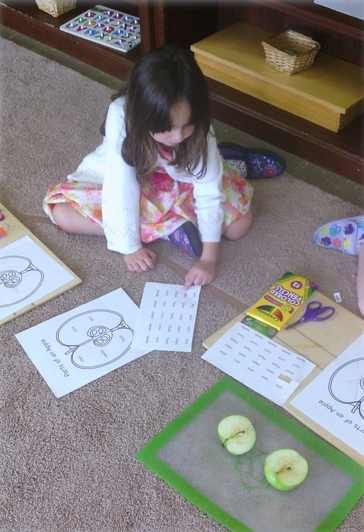 The next day we created a chart from seed to apple: The life cycle of an apple. I started out by cutting an apple in half and showing the children the seeds, which are called pips, the core of the apple, the flesh, and the leaves. The children were able to pass around the apple so they were able to see the different parts of the apple. We then drew the inside of the apple and labeled the different parts. We also had a blast making apple prints and other apple projects with Ms. Ashley! On the last day we had an apple taste test. The children tasted ten different types of apples and then we graphed the ones we liked best. The Fuji apple won! The following week was all about the farm! We started out by discussing the different types of animals that you would find on a farm. We also had an exciting time discussing the different foods that you would see in a grocery store that come from a farm. 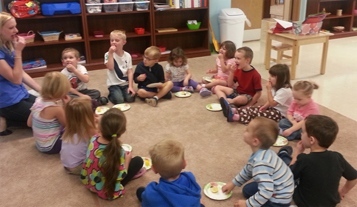 On the second day the children tasted chicken, ham, bacon, eggs, and turkey. It was funny to see all of the children’s reactions while they tasted some of these foods! The following day we talked about how not all farms are the same, and that some farms only have vegetables and fruit. The children enjoyed tasting apples, oranges, strawberries, carrots, cucumbers, tomatoes, and peppers! The last two days we talked about the life of a farmer. The children loved hearing about how the farmer has to wake up when it is still dark outside just so he can get all of their farm chores done before the day is done. On the last day I read a book about all the different types of machinery found on the farm and their purpose. The third week was all about fall! The children had so much fun with one of our student teachers who read them a book all about the different colored leaves they would find outside. The children then were able to do leaf rubbings on those leaves they read about. At the beginning of the week I read the book Leaves Leaves Leaves! By Nancy Elizabeth Wallace. We then talked about the four seasons and what happens to the leaves at each season. I then asked what they thought Chlorophyll was. Ainsley shouted out ” It makes the leaves green!” I explained to them that Ainsley was right it does keep the leaves green. I also explained to them that when our days get colder and shorter the chlorophyll exits the leaves and the green goes away and the color starts to show. The children enjoyed discussing that so much that they wanted to review it all week! Lastly, our theme was pumpkins! 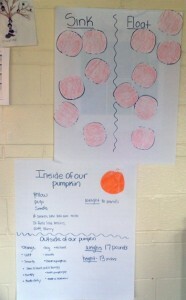 This week we created a chart of the life cycle of the pumpkin. The pictures showed that first you have to plant the seed. Then the seed turns into the seedling, and then the seedling turns into a huge vine that can be big as a house! Then a flower grows onto the vine. On the bottom of the flower a pumpkin starts to appear. The pumpkin starts out green, then yellow, then light orange, and then finally orange. The following day the children used their 5 senses and language to observe and communicate about a pumpkin. 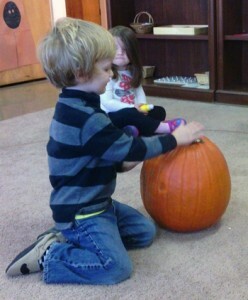 The children were able to touch, look at, smell, weigh, and measure the pumpkin. After they did this I charted their thoughts and comments. The next day I asked the children what they thought the inside of a pumpkin looks like. After our discussion, I cut open the pumpkin and had the children use their senses to explore the pumpkin. After I removed the pulp we weighed the pumpkin so we could compare the weight from before we gutted it. On our last day we did a sink and float activity. The children created a graph with paper pumpkins. If they thought the pumpkin would sink they placed the pumpkin in the correct category and same if they thought the pumpkin would float. We placed the pumpkin in a tub of water and the pumpkin floated!! We then discussed the concept of buoyancy. Posted on September 1, 2013 at 10:42 pm. The start of the school year brought back so many faces I haven’t seen in a year or more. It has been so nice to reunite with my students from years past. I am enjoying teaching a new age group this year and I am excited about all they are learning! Each day we read from either “Everyday Graces” or “365 Manners Kids Should Know.” While reading one of the stories about family dinners a few of my students asked if we could have a family dinner at school. 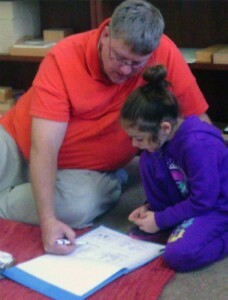 Of course I didn’t want to pass up this incredible teaching moment, so we did! As a class we created a menu and each student provided a food or drink to share. We rearranged all the tables in our room and sat down to a Family Style Lunch. Students loved asking “Can you please pass the corn?” or “Will you please hand me the salad dressing?” I was impressed with their patience and etiquette. Everyone asked if we could have Family Style Lunch every month. Anyone who has walked down the hall outside our classroom has seen our note cards posted along the coat rack. Each day we create a new card telling us the date, weather and current events. It is the responsibility of a new student each day to copy the note card and hang it in the hallway. We are creating our very own class timeline. It is neat to go back and read what was happening a few weeks ago. Responsibility and self-government seem to have worked their way out of our society in recent years; however, I am determined to teach them to your children. Responsibility is being accountable for your actions and choices. In the Elementary program responsibility is the name of the game. Each week I create a Work Plan for every student. This Work Plan is the child’s responsibility to complete throughout the week. They are responsible for managing their time, recording their work in a journal and then presenting it to me at the end of the week. 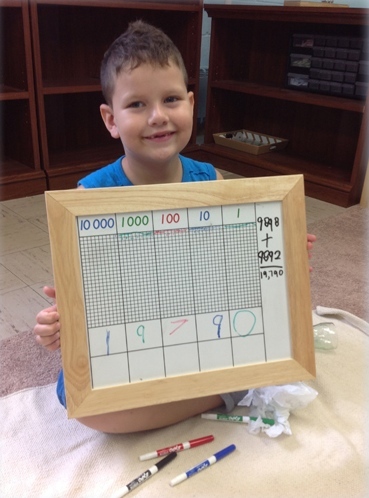 Each student is expected to set educational goals each week based on lessons they have been given. These goals are essentially their classroom “to do list” for the week. Students write their goals on their Work Plan every Monday morning. On Fridays, we have Student/Teacher Conferences where each child presents their work from the week to me. During these conferences I ask each student what work they are most proud of and what work was the most difficult for them to complete. I check their journals and look at the work they have recorded. If they did not meet a goal, they reset the goal for the following week. This is one of my favorite parts of the week! We the student of Absorbent Minds, in order to protect our freedom, create fairness, and ensure a peaceful environment, establish this Constitution of Absorbent Minds Montessori School. 2. Push in your chair. 3. Always use kind words. 4. Do random acts of kindness. 5. No whining or complaining. 7. Look out for each other. 8. No chewing with your mouth open. 9. No talking with food in your mouth. I was very impressed with several suggestions made and very happy to see such kind “rules” added to our list. The full Absorbent Minds Montessori School Constitution has been professionally printed and each student signed the final document. Click here to view the Absorbent Minds Constitution. It is a blessing to me to spend everyday with such a talented group of children. Thank you to every parent for sharing your child with me! Posted on September 1, 2013 at 2:31 pm. The first week the classroom was full of laughter and excitement. During our line time we discussed the rules of the classroom: that we will always respect each other, we will try our best, we are a team, we learn from our mistakes, we create, and we will always celebrate each others successes. Throughout this month the children have been praising one another during work time and helping each other when they see someone using a word the wrong way. It has been a pleasure seeing and hearing the children remembering all of the rules we have gone over. Also, during the first week I have been introducing different words little by little to the children. I want the children to feel comfortable and have an understanding of the different words when they are using them. Using the word “please,” “thank you,” “excuse me,” and “I’m sorry” were the lessons we learned while we were discussing the topic of respect. For the first lesson, we lead a discussion about when we should say “please” and why it is important to use it. The children then created a word poem based on each letter within the word “please”. The children then choose some of the words they created and turned them into sentences. Throughout the week, the children created word poems and sentences while using the other kindness words and have been working hard practicing each one. 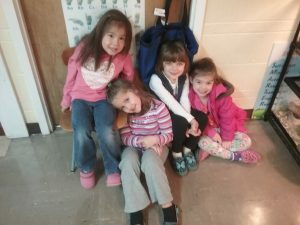 The second week we focused on friendship. We started out by discussing the meaning of being a good friend and what qualities are in a good friend. 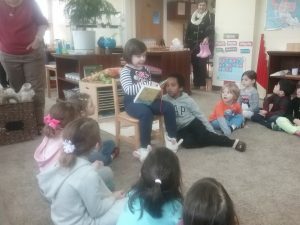 We then read the book Do You Want To Be My Friend? By Eric Carle. 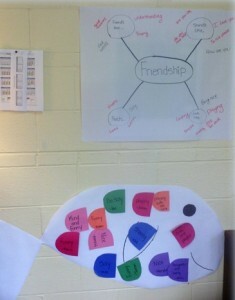 The children discussed the mouse’s search for a good friend and what qualities were in each friend. 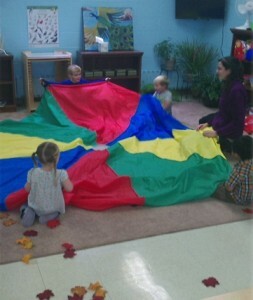 After the story the children were able to create a friendship rainbow. The second lesson was called The Friendship Fish. We read the book Rainbow Fish by Marcus Pfister. We then created our own “Friendship Fish.” The children were each given a scale and they wrote down the qualities they thought a friend should have. Ainsley said, “I want someone I can play with.” Meryem then said “I want someone who is nice,” and Jonah said “I want someone who will be silly with me.” After everyone shared their qualities they were able to tape their scales to the fish. Throughout the week the children learned how playing together can foster friendships and build a community. The children then played a game called “The Blob.” The children had to work together by linking arms and hands to capture the other friends. On the last day, our class created a “Friendship Web.” The children were able to discuss what friends should sound like when they are together, how it feels when friends are together, what it looks like when friends are together, and the qualities in a friend. The third week we discussed “All About Me.” We started out by reading the book “Stand Tall” Mary Lou Melon. We then talked about the differences and similarities in everyone’s appearance. We then created a graph about hair and eye color. The children were able to go around the room and see who had brown, black, red, or blonde hair. They did the same for eye color. The children were then able to see how everyone’s appearance is not the same. The next lesson the children created a bar graph about everyone’s birthday. I read the book “On The Day You Were Born.” We talked about how everyone’s birthday is different and that makes us unique and special. The children then decorated their own birthday cupcake. Throughout the week we made an “I’m Special Book” and played a “How Do You Feel” game. The last week was all about our families! We first lead a discussion on what they think a family is. Annelise said, “My mommy and daddy.” Jackson said, “My sister, mommy and daddy.” Myla said “My whole family.” During the week we discussed how not all families are the same. We have different houses & places families live, the tradition families celebrate, and the special things that we love doing with our family. During this week the children and families created their own family trees. 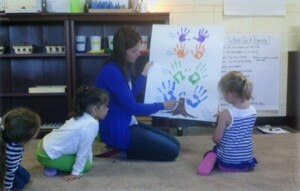 On the last day, the children were able to stand up at line time and share their family tree amongst their friends. It was so wonderful to see the children and their parents work and come together to create something so awesome! Posted on September 1, 2013 at 2:18 am. After what seemed to be a very short summer break it was good to get back in the classroom and start teaching. I do miss the Alumni, eager to get to know the new students, and get reacquainted with the returning students. It is amazing how students change over the summer. Some are more mature and some look as if they grew six inches! The first two weeks we went over the ground rules of the classroom. We reviewed the “big four” rules. 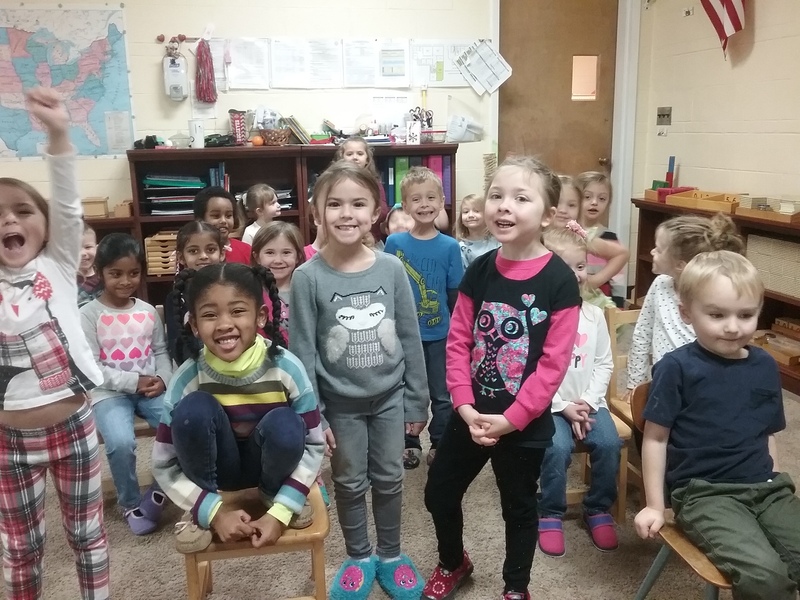 Walk in the classroom: because if you run, fall, and hit your head on a table, chair, or the hard ground; which would win, your head or the super hard table? That’s a no brainer, pun intended. Keeping your hands and body to yourself, use your listening ears, and be respectful in the classroom. We focus on being kind to others and respecting the materials. We then explored the subject of healthy habits. Washing hands and our bodies, exercising, eating healthy, and getting enough sleep were needed to keep a healthy mind and body, although we can have specific training to have even a better body, as for the mind we can find resources online for example the power of your subconscious mind pdf show you the best techniques to improve your mind power. Healthy habits created a good segway to the introduction of the food pyramid. We learned what the food groups were, what foods were in each food group, and servings of each. We had examples of many fruits and vegetables. I quiz each child at lunch time about what foods they have and the group in which they belong. The next week we took a look at what was living and non living. It was pretty easy to identify what was living and non living but we went a step further and determined what characteristics were needed to be labeled living. Reproduction, growth, taking in nutrients (eating), and exchanging gases (breathing) were the four categories we reviewed. We discovered that the children were living but Mr. John’s shoe was not. A chair was non living and so were Ms. Dana and Ms. Kathleen before they get their morning coffee! We have counted to 10 in eight different languages: English (our native language), Sign Language, Spanish, German, French, Greek, Japanese, and Arabic w/ the Lebanese dialect. 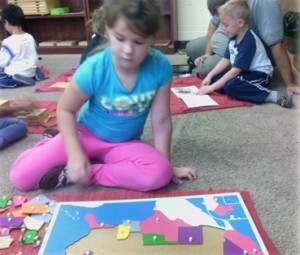 We kicked off the Kindergarten season with a dose of Geography. They learned about the seven continents, fun facts about the continents, and a few countries in each continent. They are very familiar with the cardinal directions, the equator, the prime meridian, and the hemispheres. They even know the North America is in the Nort h Western hemisphere. We then looked at our home state of O-H-I-O and the surrounding states (their abbreviation and nickname). PA-Keystone State, WV- Mountain State, KY-Bluegrass State, IN-The Hoosier State (what in the world is a Hoosier?) and that…(sigh)… state up north MI-The Wolverine State. Ask your child all about Ohio! The cardinal is the official bird, scarlet carnation the official flower, lady bug is the official insect. I see a consistent theme of red! Even tomato juice is the official drink! We are the BUCKEYE state and for some reason they got the impression the only college football team that matters is THE Ohio State Buckeyes! The official rock and roll song is Hang on Sloopy performed by the McCoys in 1965. Hang on Sloopy, Sloopy Hang On… O-H-I-O, YA! Posted on September 1, 2013 at 2:13 am. To begin our school year we focused on grace and courtesy, love and respect, self-control and self-government. We develop these skills through purposeful work, beginning in the Practical Life area of the classroom. Practical Life is an essential component of the Montessori curriculum. 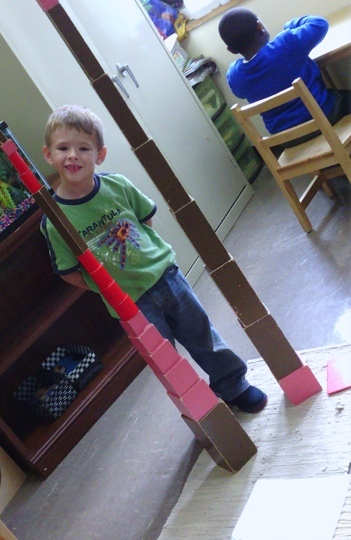 Children learn skills that promote order, concentration, coordination, and independence. Therefore, many of the Practical Life activities are a preparation for math and language acquisition. The materials in Practical Life are set up in a very orderly manner. The easiest work is located on the top left of the shelf. The child progresses through various levels of difficulty as the work becomes more involved or complex. For example, the first pouring work is two cups or containers that have no handles and no spouts. Usually one container has a dry ingredient such as beans. More difficult pouring work may include using a funnel to pour a liquid from one container to another. 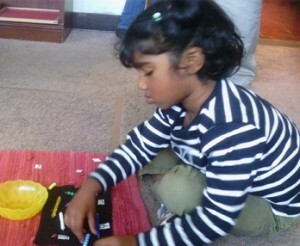 Concentration is developed when the child is able to freely choose what she/he works on and for how long. 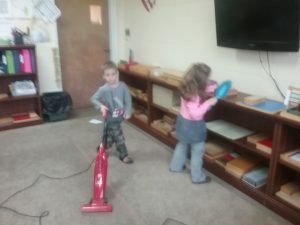 As long as the child is not damaging the work nor is being disruptive to the other children and is not “hiding behind the work,” the child is free to develop his/her self-government skills through this independent work. The child can repeat the exercises as many times as he/she desires. 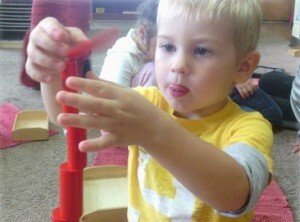 Choice and repetition helps the child develop concentration. Another component of Practical Life is movement. The materials in a Montessori environment are set up on shelves, in baskets or on trays so that the child can use a work at will after being given a presentation on it. The environment is purposefully designed so that the child can coordinate his/her movements and independently carry her/his basket or tray to a table. This freedom of movement allows children to develop courtesy; saying “excuse me” when passing another student. “Walking on the line” is another aspect of movement. As a child learns to control his/her body movements, he/she becomes more confident. After our line walk each day we discussed what is means to be courteous of others, respectful of others and kind to one another. All students agreed that when we say “please,” “excuse me” and “thank you” we are being kind and respectful. We can show each other respect by the words we use and by how we help one another. 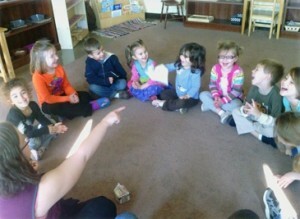 We played The Silence Game, where the children sit quietly and listen to the sounds around them. We invite Hoot, our classroom owl to join us, and we light a candle in the center of our circle. Everyone sits quietly for about one minute listening, and then we discuss the sounds we heard during our game. This is becoming a favorite group activity. 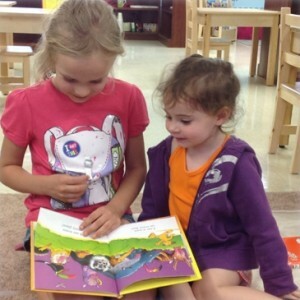 Children also learn social skills through Practical Life lessons. Children learn how to greet someone, how to appropriately interrupt, how to watch a friend work…Through direct instruction on some of these social skills, children learn early on how to handle a variety of situations. We do not assume that the child knows how to handle situations. Instead, we break down a task into step- by- step directions so the child can successfully learn social skills. Children also practice how to greet a visitor to the classroom, or give a guided tour. These and other skills are shown and practiced first and then implemented into daily living. Ms. Kristen has been working with the students and planning wonderful lessons in the afternoons. The children have been singing, composing songs, learning sign language as well as cooking! She has also reinforced the ground rules that we have been working on. The consistency she provides for the classroom is a big part of why the beginning of the school year has been so successful! We hope you are seeing some of the courteous and respectful behaviors we have been practicing in the classroom modeled at home. 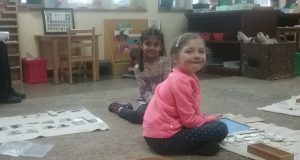 We have enjoyed our focus on practical life during the month of September it is the foundation of the Montessori curriculum that helps your child grow and mature in many ways as well as to become life long learners. Posted on September 1, 2013 at 1:55 am. Wow the first month of the school year flew by! I would like to start off by thanking everyone who came to meet the teacher night and the ice cream social. I had a wonderful time talking to you all about the class and your children before the school year began.We kicked off our school year focusing on grace and courtesy to teach and fulfill our students innate need for order. Every student has aneed to know and to absorb the social structures in order to be more at ease in their environment. Grace and courtesy lessons give the student the vocabulary, actions, and steps required for them to build their awareness and responsiveness of those around them. We worked on walking in the classroom, using our inside voices while in the school building, using kind words to one another, using safe hands, how to clean up our area when we are done working and how to use our words to express our feelings. 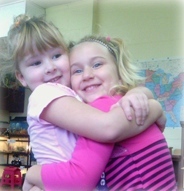 The third week of school we talked and learned about community helpers. We had many of volunteer community helpers come into the classroom and talk to the children. They briefly described their occupation, by talking about where they work, what they wear, tools they use, and tasks they perform. I would like to thank all of the volunteers that came into the classroom! It was a wonderful learning experience for both the students and myself! The fourth week of school we discussed families and the students shared their family trees with their friends. Their family trees included their name, parents, grandparents, and great-grandparents. The students also brought pictures of their families either on the family tree or hard copies for the children to share with their friends. The children enjoyed learning more about their friends and where they came from. It was great to see the students discover the differences and similarities in all of the families and accept every family for who they are. We ended the month of September talking about feelings and emotions. The students brainstormed things they could do when they were angry, happy, sad, frustrated, and excited. Then they discussed with one another whether the reaction they came up with was a good choice or a bad choice. The students did a great job learning how to manage their emotions. We role played how to process, identify and appropriately express their emotions as much as possible. After a few days of talking about feeling and emotions it was great to hear the students tell their friends what they were feeling and why on their own. As many of you already know I will be taking a maternity leave of absence. My last scheduled day before the leave is Friday, October 4th. I will be popping in and out of the school the week of October 7th to help Ms. Faith and her substitute teachers in any way to make their transition smoother, but as of Monday, October 7th, Ms. Faith will take over my class. I will look forward to returning in January! I also wanted to take the time to let all of the parents and students know my husband and I really appreciate the baby gifts. Thank you! It is very generous of you and we sincerely appreciate it. I feel so blessed to have such supportive parents like you in our lives. After baby Lydia is here I am hoping to bring her by the school for the students to meet her at the Halloween party. Again thank you for your thoughtful gifts! Posted on February 7, 2013 at 3:25 pm. This title is just a little bit of cheekiness and a lame attempt at political satire on my part. HEHE. If you follow me on Facebook you’ll notice I stay clear of the subject of politics. Actually, this babbling will have nothing to do with politics but thoughts about the Montessori classroom and my belief in HOW GREAT it is! When I first was introduced to the Montessori philosophy I thought to myself… The students will run a muck. There is no organization. There will be no discipline. In my head were thoughts of a wild chaotic classroom where the children are CRAZY! As I quickly discovered the students almost immediately start to choose work on their own, work well with others, and work well by themselves. The teachers have a detailed plan of what the students are to be presented, or need extra work on. 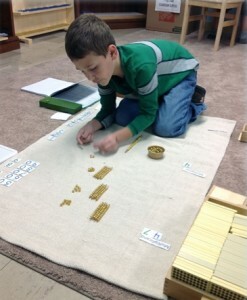 So, there is a method to the Montessori madness! No other learning environment will you get children at 3 years of age having the freedom to choose their own works or the older children taking on leadership roles. 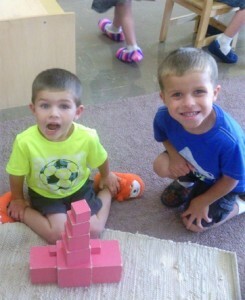 The great Montessori environment is an amazing thing. We all returned to school after a well rested winter break. Due to the long break we did a refresher week covering the classroom ground rules. We went over the four basic rules of: 1) No running in the classroom. We do not run because we can get hurt or hurt someone else. 2) Use our listening ears. The students pay attention to the teachers during line time and before cleaning the room with the special vacuums, read more about what we use here. Important robot vacuum comparison are made and information is shared during line time and listening is a sign of respect and courtesy. 3) Keep our hands to ourselves. We do this to honor other student’s personal space. In addition, we do not hit, punch, push or do anything to physically hurt other students. 4) Respect others. This is basically being nice to your fellow students. Use nice words, smile instead of giving mean faces, sharing, and helping those in need. We also talked about family (since we spent so much time with them over the holidays). We talked about our mom and dad and what we call them (Mommy, mama, daddy, and papa). We also have grandparents that we call yaya, papu, oma, papa to name a few. We told stories about our aunts, uncles, cousins, and of course our brothers and sisters. We determined that pets are part of our family even though they are not human. To honor the late Dr. Martin Luther King Jr. we learned a bit about his life and his accomplishments. The students became actresses and actors as they recreated Rosa Parks making her stand on a bus in Montgomery, Alabama. The students enjoyed playing the part of the bus driver, Rosa Parks, “the mean guy”, a police officer, Martin Luther King Jr., and passengers on the bus. We discussed our differences such as skin color, eye color, hair color, and gender. Then we discussed how we are similar. We talked about our differences. We talked about if someone with red hair wouldn’t be allowed to do art “just because” they have red hair or if anyone who had blue eyes would have to go to a different classroom with less materials, broken crayons, or no books “just because” they have blue eyes. To illustrate this, I had only boys fetch the chairs for the skit and brought that to the attention of the class. We had some very sad girls…. I did let the girls take the chairs back after the skit. We started to learn about our body and how it works. We learned about our five senses (touch, hearing, sight, smell, and taste). Did you know you can “feel” with any part of your body? We hear loud noises, quiet noises, high and low noises. We need light to see and if we close our eyes we can’t see. There are good smells like cinnamon, vanilla and bad smells like a dirty diaper and vinegar. My favorite was the taste test where we tasted sweet (sugar water), salty (potato chips), sour (pure lemon juice), and bitter (unsweetened baking chocolate). The children enjoyed “most” of the tastes. We ended the month about learning more about our body. 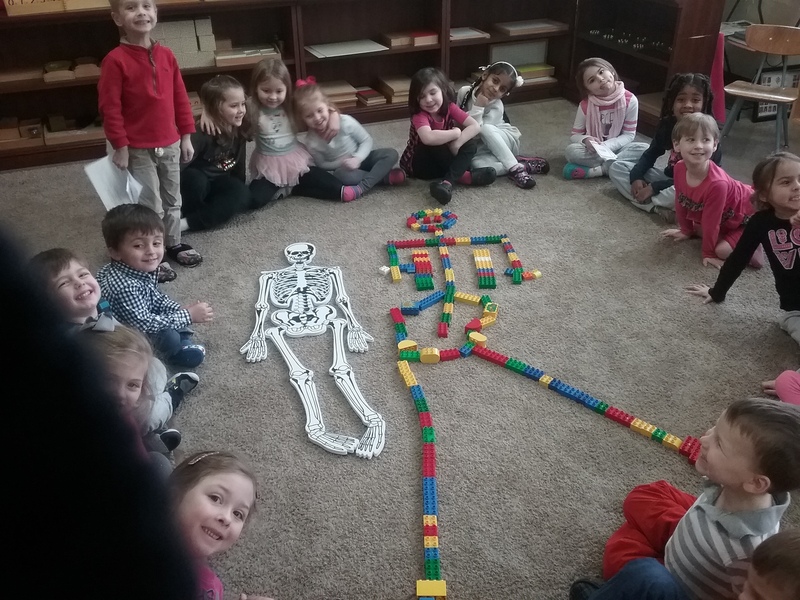 We looked at the skeletal system and if we didn’t have a skeleton we would be one messy blob on the ground.. We learned the skull protects our brain, the rib cage protects our lungs, and the spine keeps us sitting and standing straight. We learned technical terms for our arms, leg and our digits which is a funny name called phalanges. We brought our life sized foam puzzle into our room. His name is Elvis because we learned about the pelvis and it was a cool rhyming name. We had a former student, Anna F. read to our classroom her favorite book with seventeen stories about pirates. During line time lesson we can count to 10 in twenty three different languages (English, Latin, Spanish, Sign Language, German, French, Greek, Japanese, Arabic w/Lebanese dialect, Italian, Russian, Romanian, Swedish, Tagolog, Hebrew, Korean, Hungarian, Polish, Irish, Kiswahili, Welsh, Dutch/Flemmish, and Serbo-Croation). This month we started our section in Math. We learned about the unit (ones), ten, hundred, and thousand columns. The kindergartners composed numbers, and were introduced to addition with and without carry overs. We can count to 10 in twenty four different languages (English, Latin, Sign Language, Spanish, German, French, Greek, Japanese, Arabic w/Lebanese dialect, Italian, Russian, Romanian, Swedish, Tagolog, Hebrew, Korean, Hungarian, Polish, Irish, Kiswahili, and Welsh Dutch/Flemish, Serbo-Croatian, Cebuano, and Malay). 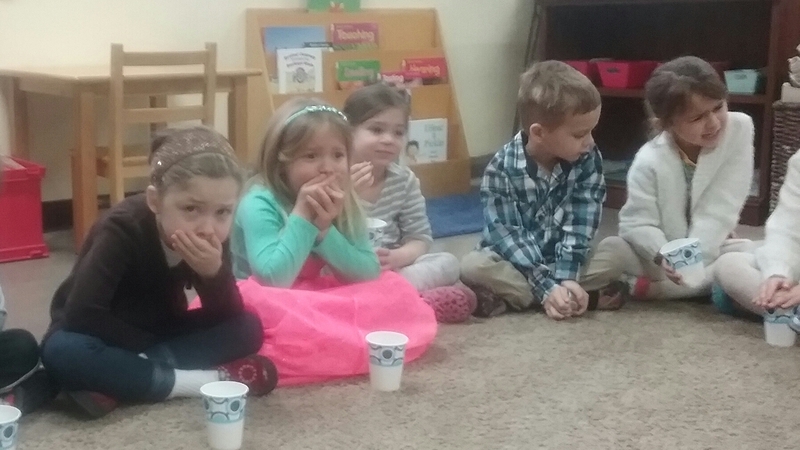 During the month of January, the Kindergarten students learned the proper formation of I-T. They also began to work on copying sentences in cursive. Some of the journal questions we answered were, “ Who is our new president?” , “ What city do you live in?”, and “ What is your middle name?”. These simple questions gave the children a chance to practice their letter formation that they have been learning since the beginning of the year! I am so proud of the progress our young writers have made! For the month of January the children read two stories called Lion At School, and Coyote Rides The sun. After we read both stories we went over any vocabulary the children weren’t certain of or they have never heard of. The children them completed an assigned drawing that allows them to record their early responses to the selection. 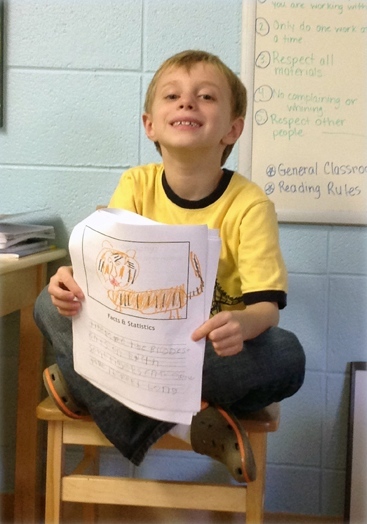 When the children choose their illustration , they are visualizing the characters and setting of the story. Throughout our readings we lead our at home discussions, and created a song that was based on the story Coyote Rides The Sun. The class brainstormed together about why they might wake up before dawn. Is it because they are going on a trip? Is it a special holiday? Below is the class song they created together. Enjoy!! So I can watch t.v. Awake in the hour before dawn. Leak Proof Baggy: What happens when we poke holes with a pencil in a baggy filled with water? Plastic bags like these are made out of our favorite materials, polymers! Polymers are long chains of individual molecules, called monomers. when you puncture the bag with a sharp pencil, you’re separating polymer chains without breaking them. The long chains of molecules than squeeze in tight around the surface of the pencil, preventing any sort of leak. The Children really enjoyed pencil after pencil being poked through the ziploc plastic bag without any leaks. Biodegradable Packing Peanuts: What happens when you put them in a pitcher of water? These packing peanuts are made from Starch, with a lot of air pockets. The Starch peanuts once wet dissolve in water just like sugar does. the children loved saying Abracadabra as Mr. John put the peanuts in water and they disappeared. Absorption, Wet Paper Towel Verses Wet Diaper which will hold more water? Mr John poured water all over a paper towel and a baby diaper and hung them both over his head, the wet paper towel dripped all over him and the diaper filled with water did not. This is because inside the baby diaper there are molecules called polymers inside, They are the small crystal like substance inside the diaper. A polymer that hold a large amount of water is called a gel, gel absorbs a solvent or water. This why the paper towel did not hold the water but the diaper did. All the children squealed with delight as Mr. John’s head got all wet from the soggy paper towel. Peter and The Wolf are back! We are learning the characters of the story, as well as the instruments involved. The children are internalizing the story well. 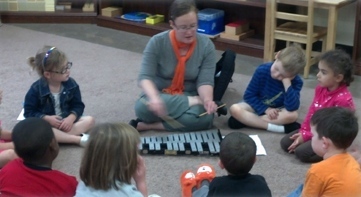 They can tell what characters and what instruments are entering the story. The children have such great listening skills! Another listening game was also played is called Cat and Mouse! The children listened well to directions, and did what was asked skillfully. They loved performing an emotion in the song with the maracas as an instrument! Music is always so much fun with Ms. Lisa! January has been cold but Miss Michele’s imagination has been on fire! Miss Michele has started one of her most creative projects of the year! Miss Michele was able to search for and acquire some extra art supplies from wordtree.io, where students learned many different things, including the importance of marketing art, which can be done in different kind of advertising, from TV ads, billboards, or even online that people do online using resources from companies as The Indexer online. They even went on a field trip! The first week the students learned about mythical creatures and took 3 different animals(one mammal, one reptile and one with wings) and created their own animal on paper! The students first sketched their animal with a pencil and then colored it in! The next week, the students used their drawings and used foil to create a base for a model of the creature! This was a little tricky for some of the younger students but all the students worked hard! After they had made the base, they then covered the foil with a white clay. They added small details like legs, eyes, mouths and wings. Miss Michele is going to bake these creations and then next month the students will decorate them! Thanks Michele for another great start to the year!